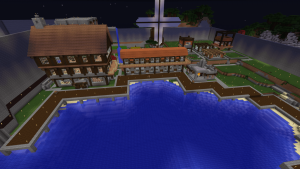 Built by Gorden, the creator of the grand "Gordy's Gate", Boomdocks is a port town situated at (-4200, 3800) in the South West Ocean. The docks, as far as we know, have fell into disuse with the absence of Gorden and have been raided on a couple of occasions, but are still intact. Please note that not all of the following buildings are yet complete or operational but will be shortly. The following lodgings are available for crew members. The best accommodation is for the highest ranking crew members. The League of Free Merchants is newly formed and looking to recruit members and form trade alliances. Any pirate interested to live and work at the Boom Docks will be assessed and if accepted will receive a welcome pack consisting of food, equipment, and rum. They will also be given access to crew accommodation and various amenities. New residents will reside in the crew house but private lodgings will be available for senior positions. The LoFM is looking to establish trade roots between allied ports in order to export and exchange items, mobs, and ships. A profit share salary is in place for all farming/crafting positions, you will get to keep a share of whatever resource you’re in charge of so long as you return at least the minimum amount to the designated store each week. For jobs where this does not apply salaries will be negotiated. All positions will be supplied with accommodation, access to amenities, and regular free food and drink. Description: Manage the farms to ensure a good return. Description: Manage the Inn, serve drinks and tell tall tales. Description: Diggie diggie hole. Diggie diggie hole. Description: Travelling across the map to established trade relationships with foreign ports and Furthering the LoFMs’ reputation. Description: Ensuring the safety of the citizens of Boom Docks. Raids and intimidation of enemy ships and bases. Description: Selling various wares and keeping inventories in stock. This page was last edited on 9 December 2018, at 00:31.